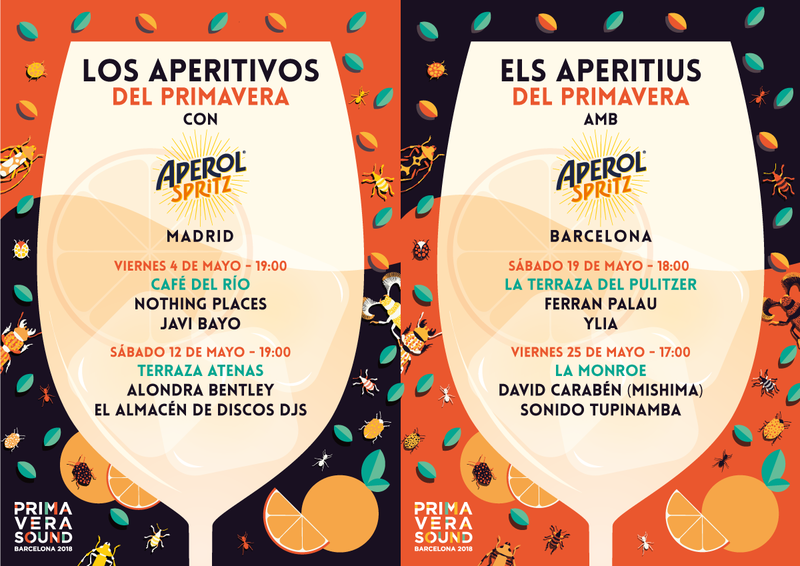 Els Aperitius del Primavera amb Aperol and Primavera als Barris amb Heineken make up the free programme in the run up to the festival during the month of May in Barcelona and Madrid. During the central week of Primavera Sound, the opening and closing days will give the Barcelona people concerts by Belle and Sebastian, Fermin Muguruza eta The Suicide of Western Culture, Javiera Mena and Rhye among many others. On June 4th at 6 in the morning, everything will be over. The final session in the Apolo will close the eighteenth edition of Primavera Sound, leaving behind it a concert-filled month with historical moments and anecdotes that will remain engraved on your memories. It will be the culmination of a long-distance race that will start soon, on Thursday 3rd May with the first concert of Primavera a la Ciutat, that is to say the that part of the festival’s programme that goes beyond the three main days in the Parc del Fòrum. Muñeco and PIVOT in Barcelona and Nothing Places and Javi Bayo in Madrid will be performing at these first concerts and will kick off the generous free offer of Primavera Sound 2018 that will include 40 concerts spread over its four proposals. The journey will include as its main novelty the first edition of Els Aperitius del Primavera amb Aperol that will appear in Madrid and Barcelona with a series of mid-afternoon concerts to be enjoyed in the company of friends. Whilst you sip an Aperol Spritz aperitif you will be able to listen to Nothing Places’s ethereal pop (4th May) and to the delicate sound of Alondra Bentley (12th May) in Madrid, and to the exquisite lyricism of David Carabén (Mishima singer, 25th May) and to Ferran Palau’s magical folk (19th may) in Barcelona. All the concerts will be preceded by DJ sessions, which will allow the audience to delve into the electronic sounds of Ylia, the tropical fiesta of Sonido Tupinamba, Javi Bayo’s eclecticism and the laid-back tunes of El Almacén de Discos DJs. 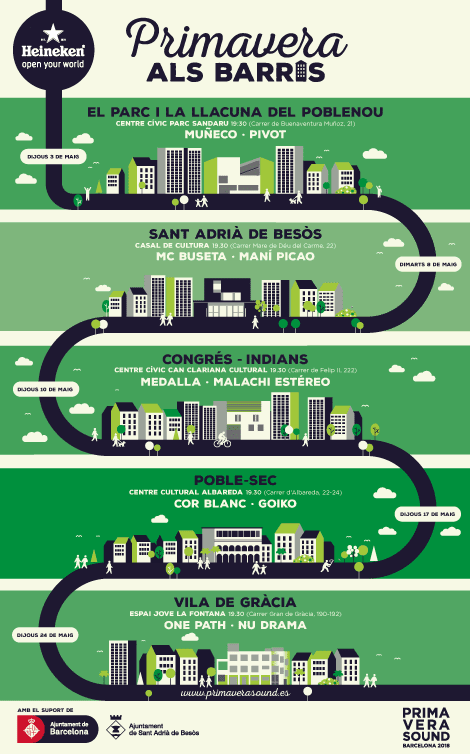 For the fourth year and almost in parallel, from the 3rd May live music will arrive in the community centres and cultural spaces of Barcelona’s neighbourhoods (Poblenou, Congrés-Indians, Poble-sec and Gràcia) and Sant Adrià de Besòs. Primavera als Barris amb Heineken will offer the opportunity to discover emerging talents from the Barcelona scene in all their diversity: from the explosive rock of Medalla and Malachi Estéreo to the smooth electronic pop from Cor Blanc, passing through the varieties of urban music by One Path, Mc Buseta and Nu Drama, world music by Maní Picao, celestial post-rock from Muñeco, PIVOT’s electronic music and psychedelic soul by Goiko. 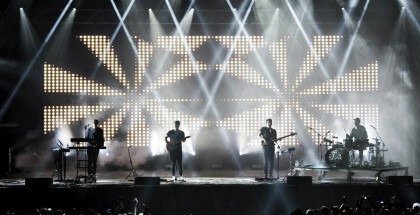 The inaugural day at the Parc del Fòrum will be the starting point for the final sprint for the thousands attending Primavera Sound. Once again the festival site will open its gates totally free of charge on Wednesday 30th May with a lineup headed by the champions of indie pop Belle and Sebastian, as well as the stage comeback of the Canadian band Wolf Parade, an invitation to dance from Javiera Mena and the new vitality of Starcrawler from Los Angeles and the local band Holy Bouncer. Also, for the first time and as an exclusive welcome present for holders of the full festival ticket, the Auditori del Fòrum will open its doors to host the much awaited concert by Spiritualized accompanied by an orchestra and choir not to mention the highly poignant performance by Maria Arnal i Marcel Bagés. 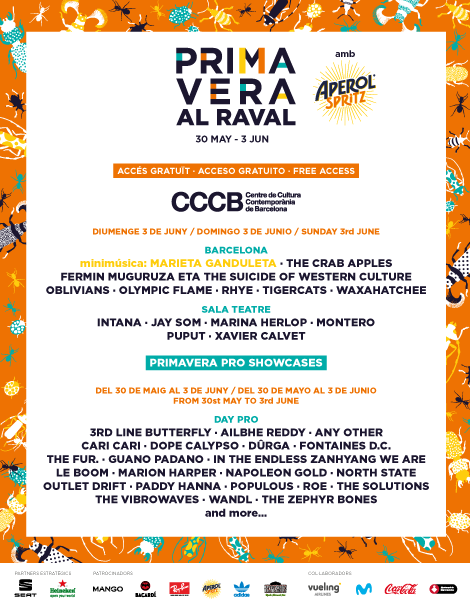 Finally after the three main days in the Parc del Fòrum, the festival will move back into the city centre to celebrate the closing day in the CCCB with 13 free concerts distributed across two stages of Primavera al Raval. Among these concerts a number are well-worth highlighting and include the explosive combination of Fermin Muguruza with The Suicide of Western Culture, repeat concerts by Rhye, Oblivians, Waxahatchee and Montero after their performances in the Parc del Fòrum, and representatives from the vibrant local scene such as The Crab Apples, Xavier Calvet and Intana. For those of you who still want more, the showcases of Primavera Pro will take over the Pati de les Dones of the CCCB for five marathon days running from Wednesday 30th May to Sunday 3rd June, all of which will be open both to the general public and to the professionals from the music industry who will meet there. A selection of artists and emerging artists from countries including South Africa, Chile, Australia, South Korea, Italy, Luxembourg, Poland, Hungary, Ireland and Taiwan among others will take the pulse of the underground scene of the five continents. It’s almost here! Can you feel the Primavera Sound vibes?